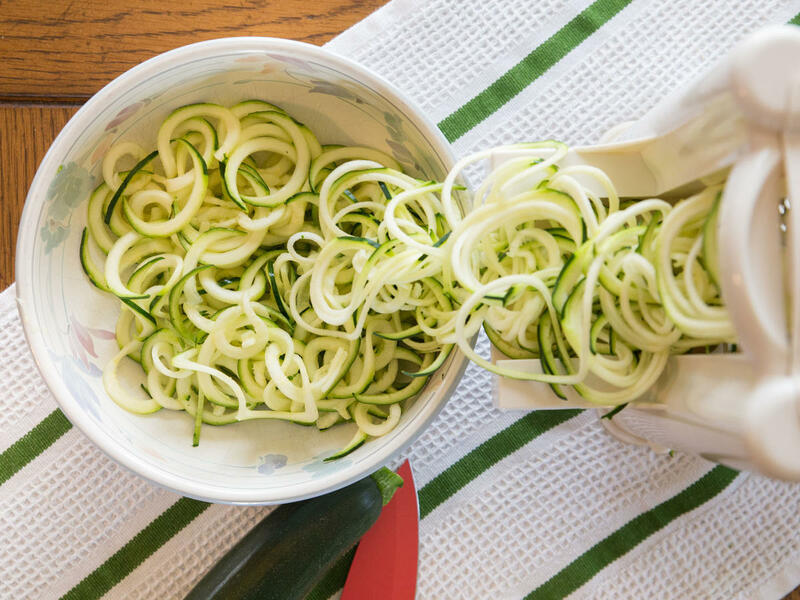 When it comes to kitchen gadgets, the spiralizer is arguably the most fun. With just a few simple turns of a handle, it transforms regular ol’ fruits and veggies into beautiful ribbons, strands, and shreds. But with that fun comes responsibility…to clean the device, that is. First, the bad news: Unlike other kitchen appliances that require scrub-downs on a semi-regular basis (think oven or microwave), your spiralizer needs to be washed after every use, says Sandra Castro, product manager at top-rated spiralizer producer Paderno World Cuisine. Why so frequent? “It’s in direct contact with food,” Castro explains, and letting that food linger on the machine could cause bacteria to build up. Neglecting to clean could also lead to staining, if you’re working with particularly colorful items, like carrots or beets. So, for both the safety of your food and the appearance of your spiralizer, you should really make an effort to be a consistent cleaner. Now, the good news: Properly washing the device is a very simple process requiring minimal materials. And, if you keep up with it, it won’t be a long or laborious ordeal. Here, step-by-step instructions for getting the job done. Carefully remove the blades from the body of the device, holding on to the plastic sides of the blades to avoid touching the blades directly. Then, placing the blades under warm, running tap water and using the brush, scrub them with dish soap until you’ve removed all food particles. After you’ve thoroughly cleaned the blades, simply let them air dry. Because they’re so sharp, drying them by hand isn’t advisable, says Castro. If you don’t have a cleaning brush and/or your blades have crusted-on bits, you can let the blades soak in warm, soapy water, says Castro. Just be careful when removing them from their bath since, as mentioned, they are quite sharp. To avoid crusted-on bits altogether, scrub the blades as soon as possible after use. “Don’t let [food] particles dry on the blades,” says Castro. Also, though it may be tempting to stick extra dirty blades in the dishwasher, doing so could cause them to wear more quickly, which is why it’s worth it to wash them by hand. Some more good news: Aside from the blades, all removable parts—the turning handle, the sliding board, the food tray, etc.—are top-rack dishwasher safe. Simply unscrew them from the body of the machine and pop them on the top rack. The body of the device is also technically top-rack dishwasher safe. The one caveat is that if your dishwasher reaches very high temperatures, the heat could damage the suction feet. It’s not an extremely common issue—Paderno sees it with about 1 in every 5,000 devices—but to play it safe, you can easily clean the body by hand by simply wiping it down with a hand cloth, warm water, and standard dish soap. If you don’t have a dishwasher, you can also wash the removable parts this way, too. If you’re cleaning by hand, avoid using harsh chemicals, like bleach and ammonia, on any part of the spiralizer, says Castro. Repeated use of these chemicals could dry out the plastic and cause it to crack. Such strong cleaning agents typically aren’t needed with a spiralizer anyway, she adds. Lastly, even more good news: The parts of the machine that don’t come into direct contact with food, like the body, don’t actually need to be cleaned after every single use. Washing them about every other use should suffice, says Castro. With that, happy cleaning, and on a more fun note, happy spiralizing!